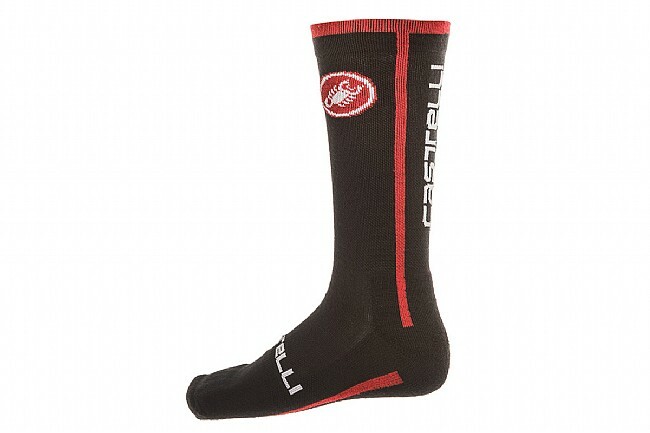 Warm feet are happy feet with Castelli's Venti Sock. As the name suggests, these socks have a 20cm cuff length, which puts them right at calf length for the average rider. The benefit of this added length is that they help to keep your feet warmer by keeping your entire lower leg warmer. Their construction from a Merino wool blend also imparts benefits like excellent moisture wicking, odor control, and comfort. The Venti Sock is available in Black/Red. I purchased the Castelli Venti Socks on sale for my winter riding here in Nor-Cal. The socks have done a great job keeping my feet warm in morning rides 37 to 45 F. The toe box area is built up a bit more than the rest of the sock providing a thicker barrier against the cold. The socks are the typical Castelli size being small for the U.S. market, I am a size 9.5 in U.S. shoe sizes and I ordered the XXL which fits well however could be a bit larger. Good socks, seem to hold up well to washing being careful that these do not end up in the close dryer. Overall good socks and I got them at a great price at BTD. These are my first choice for cold weather riding. Love the length for those frigid days. Excellent quality material, warm, comfortable, breath nicely, and look great! These socks fall are generally comparable to Woolie Boolies Woolerators and are not quite as warm as my non-branded alpaca socks. I like the height compared to the aforementioned name brands. I have not had them long enough to comment on durability, but so far so good. Very well designed and manufactured sock, holding up fine after numerous washing's too. Size Chart worked mostly OK, but doesn't hurt to size up assuming your shoe has the room. Great socks. Performs great in cold and warm weather biking. Also good for daily wear. Very comfortable. Strongly recommend it. I was looking for a wool sock that was taller than usual and this fits the bill perfectly. Extremely well made and not too thin or too thick of a material. Just right. Great calf high socks - You won't regret it. Look good, stay warm and ride hard.